Emergency waterproofing & leaking shower repairs Northern Beaches. We were recently called to repair a very serious leaking shower problem at a unit on the Northern Beaches, Sydney. What was the shower waterproofing problem? In our estimate the shower in this ground floor unit had probably been leaking for a few years. The unit was approximately 20 years old and didn’t have substrate waterproofing installed in the shower. Then, when the old tile grout cracked and failed, this allowed water to seep through to the timber frame as there wasn’t an adequate or secondary waterproofing membrane to stop it. Could this shower leak have been prevented? Unfortunately it’s very difficult for owners of old properties to ascertain whether shower waterproofing was adequate when the building was built, or during a subsequent bathroom renovation. Typically unit bathroom leaks are detected when water seeps through to a downstairs or adjacent unit. This unit was located on the ground floor therefore complaints from other residents wouldn’t have been a factor in detecting the problem. It was only the strong damp smell that alerted the owner to the shower leak. How we fixed the problem, preventing water damage from occurring again. Unfortunately, had the leaking shower problem been detected earlier, we probably could have rectified the waterproofing issue without having to remove or replace tiles. With the new substrate and waterproofing complete water cannot penetrate and cause damage in the future. The complexity of this waterproofing repair and the expertise we applied in solving the problem, is a timely warning to Do It Yourselfers who sometimes opt to fix a leaking shower themselves. It is important to note that constant water penetration anywhere within the home can cause structural problems that can be expensive to rectify. Typically, the longer it occurs the worse the problem becomes. Silicon products used to “plug” gaps, seal joints and repair cracks are usually only a temporary fix and should be monitored to ensure the seal doesn’t break down. By hiring a professional waterproofing, such as the team at Drip Dry Shower Repairs and Waterproofing, we can find the source of problem and rectify the issue to prevent damage now and into the future. In fact, we are so confident of his waterproofing expertise he offers a No Leak Lifetime Guarantee. For more information about your leaking shower problems or bathroom waterproofing issues, contact us direct on 0416 292 002 or complete our online enquiry form. We are available 24/7 to attend to emergency waterproofing problems and get you enjoying trouble free shower usage in no time. Does your bathroom smell damp? BUILDING MOVEMENT : The ground on which our homes are built is moving all the time. Although this movement is very subtle and usually unnoticeable, it causes the structures build upon the ground (i.e. our homes) to move too. As these structures shift due to ground movement, joints and corners around the home can crack, floors may become uneven and walls no longer square. This movement can cause joints in the shower to shift too causing cracks in the tile grout, the waterproofing seals to break down and sealant to deteriorate. Sometimes these cracks may be so small you may not even notice them yet they are wide enough for water to penetrate. GAPS : Over time materials used to build our homes may shrink and swell. In most instances this is normal. Sometimes, materials may deteriorate or degrade simply due to their age. This movement can also cause cracks and subtle changes in your home’s structure. 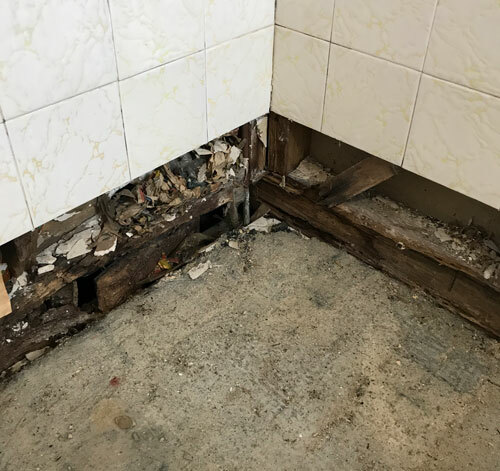 As above, these changes can appear in the bathroom and shower causing the same problems as listed above, usually exacerbating the problem as materials break down further due to constant water damage. PLUMBING : With pipes running behind walls it can be hard to ascertain that a problem is occurring until obvious signs of water leaks and damage appear (see list below). If plumbing joints become loose and subsequently start leaking than water damage will undoubtedly start occurring. WATERPROOFING : Some homeowners are of the impression that tiles and grout are what provides the waterproofing in a shower. This is not true and is a dangerous assumption. Tiles do not provide sufficient waterproofing – far from it. Correct waterproofing is the application of a special membrane that is applied below the tiles and the backing board that the tiles are affixed to. If a suitable waterproofing membrane is not applied, is not applied correctly during the shower installation or it gets a hole in it, then water can penetrate through the membrane into structural areas of the home causing significant problems. CLEANING : In some instances a waterproofing agent may have been applied to a shower to assist in the prevention (or further prevention if problems have already occurred) of water penetration. Harsh cleaning products can wear away this liquid waterproofing agent and causing degradation of this additional membrane. WATERPROOFING MATERIALS : To save money and, in same cases due to a lack of waterproofing expertise, some tradespeople and home owners may use inferior and inadequate waterproofing products when renovating their bathroom or in an attempt to fix waterproofing problems that may have occurred. The use of inferior waterproofing materials or incorrect products, while it saves money initially can actually be a lot more costly if the waterproofing material breaks down. It also gives home owners a false sense of security. TILING : While tiles are not an adequate waterproofing solution alone, they are part of the waterproofing process. If tiles are not set properly, start to crack or the grout starts to break down, this can cause water to penetrate to the backing board behind. A coat of sealer can be applied to tiles however this is usually not a long term solutions (see “cleaning” above). If you have an emergency leak or waterproofing problem, call us immediately and we’ll advise you what to do to stop the problem getting worse until we can arrive onsite and repair the leak correctly. Call 0416 292 002. Website development by RAM Marketing. Drip Dry Shower Repairs & Waterproofing Services © 2019. All Rights Reserved.